Reardon and colleagues recently published a study on the variation of human brain organization and its relationship with brain size. Using neuroimaging data from more than 3000 individuals they calculated the local surface area and estimated the areal scaling in relation to the total cortical area in order to generate a reference map for areal scaling in cortical and subcortical structures. By using three separate cohorts, three different platforms of image-acquisition, and two distinct imaging processing pipelines, they obtained the same results. Regions with positive scaling, i.e. which area increases with increasing total cortical size, were found with the prefrontal, lateral temporoparietal, and medial parietal cortices, whereas the limbic, primary visual, and primary somatosensory regions showed negative scaling. These patterns of cortical area distribution relatively to normative brain size variation were also reproduced at the individual level in terms of proportion, as, for instance, areas of positive scaling regions were positively correlated with the total cortical area. These patterns of areal scaling distribution are also comparable with patterns of brain expansion during human development and primate evolution (humans vs. macaques). In terms of cytoarchitecture, the regions of positive scaling were concentrated within association cortices, such as the default mode, dorsal attention, and frontoparietal networks, while the negative scaling regions were found within the limbic network. The association of areal scaling patterns with known patterns of mitochondria-related gene expression suggests these regions that are expanded in larger brains might differ in their metabolic profile. The authors concluded that the similarity of the areal scaling maps across development and evolution, and at the individual level, suggests a shared scaling gradient of the primate cortex. Larger brains tend to preferentially expand association cortex, specialized for integration of information, which might point to a need for an increase of the neural subtracts, such as dendrites or synapses, in order to maintain or enhance brain function in an expanded brain. Further study designs are required to investigate the relationship between cortical areal patterns and brain function. Studying the evolution of brain form requires paleoneruologists to rely on casts from the cranial cavity from fossil species. Due to the lack of soft-tissue preservation in fossils, descriptions of macroanatomy and cytoarchitecture are taken from comparative non-human primates to serve as hypothetical models of early hominin brain form. Using extant non-human primates as models for fossil species ignores the separation of lineages, any specific adaptations and lineage-specific evolution since divergence. Furthermore, extant species risk being relegated as ‘living fossils’ with the issue worsened by the absence of identifiable fossils for either Pan or Gorilla. The untenable assumption is that extant chimpanzee anatomy should resembles the original form prior to the Pan–Homo split. Nonetheless, comparison among living hominoids is still mandatory to investigate the evolutionary radiation of this taxon. Previous published descriptions of chimpanzee sulcal patterns occur in classic literature but were based on only a few post-mortem dissections. Recently, Falk and colleagues aimed to increase knowledge of chimpanzee sulcal variation by describing sulcal patterns present in in-vivo Magnetic Resonance Imaging (MRI) from eight chimpanzees. Results suggested that, contrary to previous opinion, two sulci do occur in both chimpanzees and humans. To elaborate, these two sulci are the middle-frontal sulcus located in the frontal lobe, and lunate sulcus located between the parietal and occipital lobes. No quantitative analyses were conducted in this study, but Falk et al. (2018) provide detailed descriptions of the variation between individuals, highlighting why descriptions based on only one or two individuals cannot be used to reliably describe the brain anatomy of a species. The authors argue the presence of the middle-frontal sulcus and lunate sulcus in chimpanzees invalidates previous claims that these sulci represent derived states found only in the human lineage. Further quantitative analyses with much larger samples, including both extant and fossil species will aid in a better understanding of the brain anatomy of humans and other great ape species. In a recent paper, Fabbri et al analyzed the relationship between brain and cranial vault shape in the transition from reptiles to birds. To assess the evolution of this relationship they used a broad sample including Aves, Lepidosauria, Crocodylia, Archosauria, and Reptilia. To assess developmental differences they included an ontogenetic sample of Alligator mississipiensis and Gallus gallus. The results showed that the relationship between the vault bones and the brain is conserved across these taxa, with the frontal bone positioned over the forebrain and the parietal bone over the midbrain or over midbrain and posterior forebrain. Nonetheless, they observed some shape variations, namely on the relative sizes of the frontal and parietal bones and in the position of the fronto-parietal suture relative to the forebrain-midbrain boundary. These two structures are significantly correlated, with the fronto-parietal suture being either anterior to (e.g. stem reptiles) or nearly aligned with (e.g. crown birds) the forebrain-midbrain boundary. In terms of ontogeny, chickens have a shorter ontogenetic trajectory than alligators, as the brain and skull of embryos are similar to the adult ones. The brain and skull of alligators develop with negative allometry, with the brain relatively large in early stages but becoming relatively small during growth. Conversely, the skull and brain of chicken grow with positive allometry, and the authors suggest the brain should be considered peramorphic in Aves. Overall the results stress the important role of the brain in shaping the cranial vault. The authors wonder whether the intimate relationship between brain and frontal and parietal bones is the key for the conservation of the cranial vault across vertebrates. A group coordinated by Dr. Vera Weisbecker examined whether the evolution of mammalian brain partitions follows conserved developmental constraints, causing the brain to evolve as an integrated unit in which the partitions scale with brain size. According to this ‘late equals large’ hypothesis, the timing of neurogenesis predicts the size of the partition such that later and more extended neurogenesis produces larger partitions due to the production of more neural precursors. In order to investigate the impact of neurogenesis on patterns of brain partition growth, the volumes of the whole brain and major partitions were reconstructed from soft-tissue diceCT scans of three marsupial species, including individuals with ages ranging from 1 day to adulthood. They tested three hypotheses consistent with a conserved brain partition growth: H1 postulates that partition scaling during development reflects the evolutionary partition scaling, and thus growth patterns should be uniform between species; H2 assumes that a neurogenesis-driven pattern of partition scaling is predictable from adult brain size, i.e. brain partitions scale with brain size; and H3 states that growth with age might differ between species according to brain size and/or neurogenetic events. Regressions of log partition volume against log rest-of-the-brain volume (whole-brain volume minus partition volume) showed significant interspecific differences in slopes and intercepts of most brain partitions, indicating diverse scaling patterns between species, which could not be predicted by adult brain size, as the smallest-brained species had intermediate slope to the other two. Growth curves of log partition volume against age were similar in all partitions within-species, but differed between species, particularly in growth rates, with the species with intermediate brain size having slower rates than the other two. Differences in growth patterns do not seem to be related to neurogenetic schedule as largest partitions are not especially late in their development and important maturation processes, like eye opening, occur closer to the end of the growth phase. Thus, none of the hypotheses are supported by these results, challenging the conserved neurogenetic schedules behind the evolution of mammal brain partitions. Moreover, the authors found high phylogenetic signal in brain partition scaling, revealing that a large part of the scaling relationship between brain and partition volumes is explained by phylogeny, which is more in agreement with a mosaic evolution of brain partition sizes, stressing its biological meaning and the level of mammalian brain plasticity. However, the intraspecific regular partition growth curves led the authors to contemplate the existence of an early brain partition pattern regulated by regional gene expression, and propose that further studies of brain partition evolution should integrate developmental neuromere expression models, neuron density, and patterns of neuron migration. The middle cranial fossa houses the anterior and lateral portions of the temporal lobes. The evolutionary changes of this area in the human genus have been largely investigated by different teams coordinated by Markus Bastir and Antonio Rosas, at the Museum of Natural History, Madrid, Spain. They suggested that inter-specific differences in its morphology (namely a forward displacement of its anterior tip) can be associated with the relative enlargement of the temporal lobes described in modern humans, when compared with apes. They also provided morphological evidence of general differences in the endocranial base between modern humans and Neandertals. In their last article they include also considerations on the sulcal pattern, as visible on the endocranial surface. We have to keep in mind that the endocranial base is influenced by many different factors, and many of them are not associated with actual brain changes. The central position in the cranial base makes the middle cranial fossa sensitive to the development and evolution of the many surrounding structures. The same authors have shown before that the morphology of the middle cranial fossa is significantly correlated in terms of spatial organization with the morphology of the mandibular ramus due to direct physical interaction, being integrated as a modular unit. This integration can be associated with interactions between basicranium, brain and masticatory system during evolution and development. The middle cranial fossa also correlates significantly with the face, constituting a “bridge” for the interaction between the face and the neurocranium. In sum, the morphology of this area can be influenced by traits and processes associated with the face, with the many factors involved in the morphogenesis of the cranial base, as well as with the endocranial soft tissues (brain, meninges, vessels). Despite the neuroanatomical evidence of relatively larger temporal areas in our species, the exact correspondence and match between middle cranial fossa and temporal lobes may be more complex than a simple equivalence between a structure and its negative mould. 1. Paleoneurology resurgent! (Ralph Holloway, Columbia University); 2. Neuroscience and human brain evolution (Laura D. Reyes and Chet C. Sherwood, The George Washington University); 3. Computed tools for paleoneurology (Philipp Gunz, Max Planck Institute for Evolutionary Anthropology); 4. 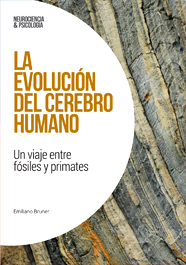 Functional craniology and brain evolution (Emiliano Bruner, Centro Nacional de Investigación sobre la Evolución Humana); 5. Human brain evolution: ontogeny and phylogeny (Simon Neubauer, Max Planck Institute for Evolutionary Anthropology); 6. Paleoneurology and behaviour (Natalie Uomini, University of Liverpool); 7. Neuroarchaeology (Dietrich Stout and Erin Hecht, Emory University); 8. Cognitive archaeology and the cognitive sciences (Frederick Coolidge, Thomas Wynn, Karenleigh Overmann, and James Hicks, University of Colorado, Colorado Springs); 9. Techniques for studying brain structure and function (Erin Hecht and Dietrich Stout, Emory University); 10. A digital collection of hominoid endocasts (José Manuel de la Cuétara, Universidad Autónoma de Madrid).